Sorry that I couldn’t make it to your party. I’m (so/really/terribly) sorry for being late. I’m sorry that I couldn’t make it to your party. I can’t say/express how sorry I am. My sincere/sincerest apologies for being late. I do sincerely apologize for being late. 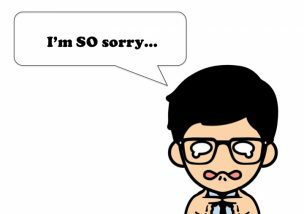 Please, accept my sincere/deepest apologies for the inconvenience. We apologize for the (train) delay. I must apologize for his behavior. I’d like to apologize to you. I’d like to offer my apologies. I’d like to apologize for my action. Excuse/pardon me. Are you Mr. Jenkins? Excuse/pardon me for the interruption. Excuse/pardon me, I need to take this call. Excuse/pardon me, may I ask a question? Would you excuse me? I need to get another drink. That was wrong of me to accuse you. That was rude of me to have you kept waiting. I’m ashamed of his action. I’m embarrassed by his action. Please, forgive me for asking you a personal question. Please, forgive me for what I’m about to say. I have no excuse for what I did. I promise I’ll make it up to you! We’ll say no more about it. OK, but I’m not happy about this. OK, but I’m still upset about this.